This kaleidoscopic mosaic of brilliant colour depicts a sun-drenched idyll in which two women disport in a verdant Arcadian landscape. Two tall trees to left and right frame their Eden. The sun’s disc and its associated aura, represented by cubes of differing hues of yellows and pinks is sinking slowly projecting a reflection in the sea. This is Metzinger’s personal take on the Neo-Impressionist method, using blocks of intense ‘fauvist’ colour to build his image rather in the manner that a mosaicist places tesserae into the wet ground. Throughout the painting Metzinger has used every colour in the visible spectrum. 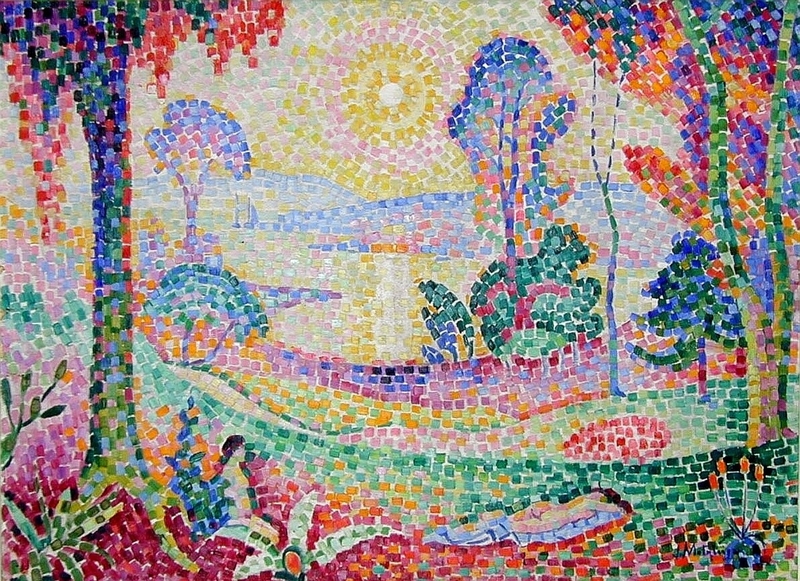 Metzinger was at this time influenced by Henri Edmond Cross, many of whose Neo-Impressionist compositions were paeans to the seductive beauty of the (then) unspoiled nature of Côte d’Azure. This picture follows in the footsteps of such works as Cross’s lyrical Evening Breeze from 1894 and Matisse’s Luxe, Calme et Volupté (painted while he was visiting Signac and Cross in 1904). These in turn owe a debt to earlier Symbolist artists such as Pierre Puvis de Chavannes. This picture was exhibited at the Salon des Indépendants in the spring of 1907 but may have been started as early as late 1905. It represented a step towards the eventual dislocation of art from the representation of nature heralded by the arrival of Cubism in the next few years. Metzinger’s contribution to this metamorphosis was of the utmost importance.